Hopefully you’ve seen Taggloo by now and read about how it was inspired. 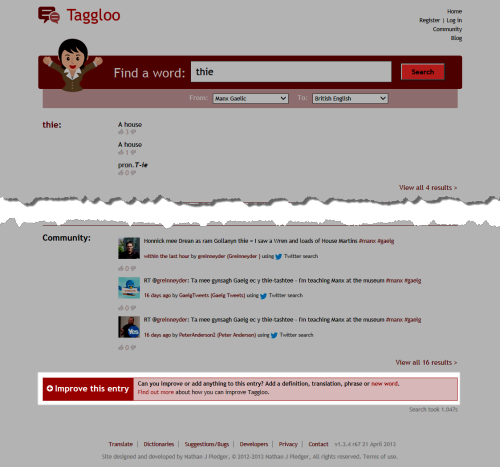 Taggloo was always intended to bridge the gap between translating words and the use of those words in the community. The last major feature launch was the aggregation of community content where minority languages such as Manx were used in social media. This allows a user to identify other interested people that they can connect with and for these real-life uses of language to be included in translations. It’s a neat idea and one that is starting to bear fruit now the code has been active for around 9 months. The next step was to extend the idea of community with user-generated content and authority. The Taggloo dictionary contains tens of thousands of phrases and translations, but they were fairly static. The inclusion of community content in social media extended the richness of the dictionary, but without the structure of a dictionary. With the latest update, users can contribute their own words and add a wide variety of improvements to existing words. For example, you can add a phrase, sound file, web site or definition. Taggloo also supports the concept of mutations and plurals to further extend the richness of the dictionary. Learners and experts alike are encouraged to add common phrases, their own translations, perhaps modern concepts such as internet terminology or idioms to help extend the richness of the dictionary. But how do you know how reliable dictionary data is, if anyone can submit their own content? Content is submitted by users with a seeded vote of zero (0). Then, as other users use it, they can “vote up” the item, increasing the item’s score. Search results are sorted on this score, so the authoritative submissions are always presented first. Conversely, if a translation or resource isn’t appropriate, then it may be “voted down”. To add to the “social” dimension of Taggloo, the site now supports Facebook authentication. You don’t need to create a new username/password if you don’t want to (though you can if you wish or are not a Facebook user), instead, just log in with your Facebook username and password. The site will never know your password, so that’s one less thing to worry about! If you haven’t yet come across them, check out the Facebook page or Twitter stream at @TagglooIM where you can be introduced to new phrases and keep in touch with Taggloo developments. ← I’m investing in Windows RT, not Windows 8. Here’s why.